It is homecoming this week for Brylee. Each cheerleader was paired with a football player. The football player decorated the cheerleaders door and brought her a surprise and the cheerleader decorated the football players door and brought them a surprise. Brylee and Jacob have been buddies since kindergarten when they were in the same class; they live in our neighborhood and they ride the bus together. 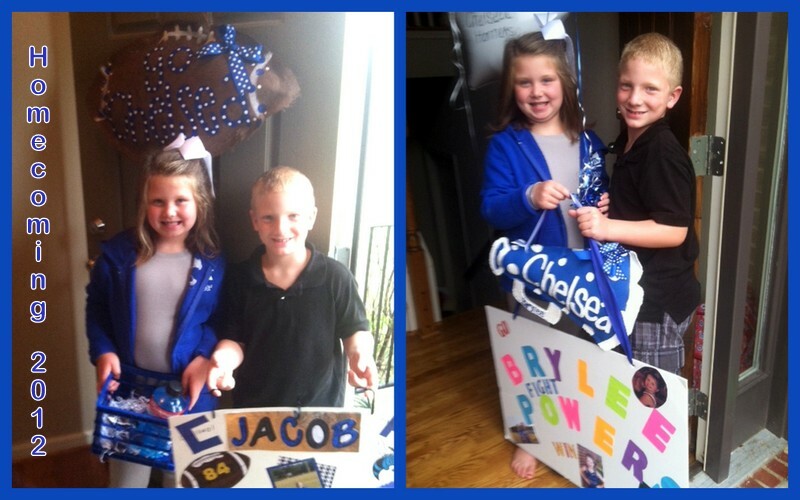 Brylee and Jacob had fun making each other feel special! We made a poster for Jacob and gave him a goodie basket too.. we also gave him and his family a burlap football with go chelsea on one side and geaux tigers on the other (b.c they are big LSU fans)! :) Jacob made Brylee a poster and gave her some balloons and a burlap megaphone for our front door. She was super excited! :) Go Chelsea!! !